Welcome to my 1st blog post about the best-yet-easiest method I have found for seed germination. This is known as Wet Paper Towel method. You do not need any soil for this method. 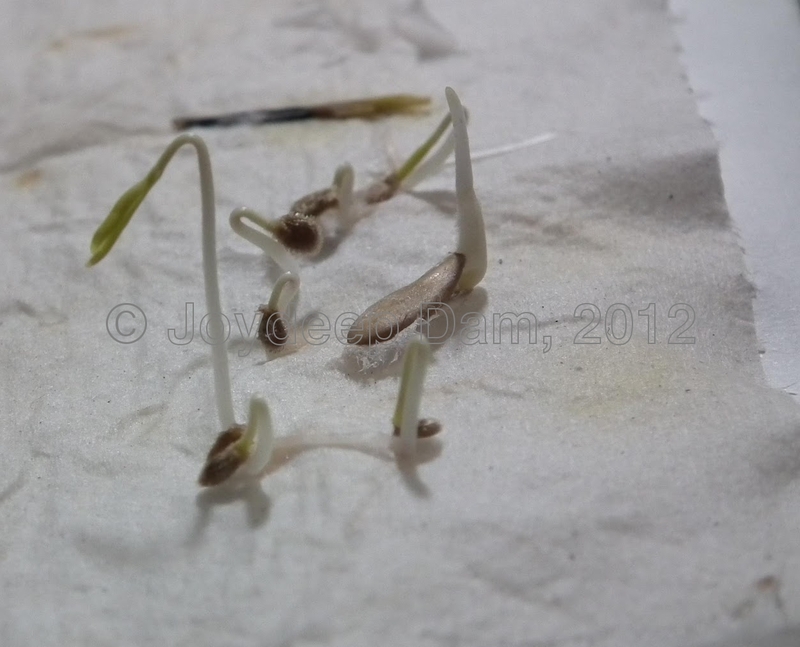 The wet paper towel is one of the easiest and effective ways of germinating seeds. I can convince you that the germination rate is nearly 100%. All my lettuce, carrots, hot/sweet chili peppers, tomato, corn, cucumber, basil and many other flower seeds have been germinated using this method. Even I have my kiwi fruit and strawberries germinated and in short time (in 2 weeks), while lot of people are saying that these seeds are quite hard to germinate and they need 4 to 5 week time to germinate. while with this amount you may be able to buy only one plant. You can have earlier harvests. With seeds, you can have greater variety in plants. Gardening as a hobby is a highly rewarding one. It's like you have power to grow stuff which will at a time provide you a nice flower or herb garden. You will have fresh flowers, herbs or vegetables all year around. And finally, you will practice patience. It's true that you need a great deal of patience to get result from growing a plant from seed. So by now you have learnt the advantages of growing plants from seeds. Let's concentrate on the method that I have mentioned to germinate seed. Next section will provide you with the list of item you need to perform the easiest way to germinate seeds. A zip-lock plastic bag. You can also use a container whose open area you need to close plastics so that moisture will be kept inside. Some water in a container to moist the paper towel. Follow the steps below and in no time your seed will be germinated. Take 2 dry paper towels. Moist both of them separately with clean water. Make sure that all part of the towels is nicely moist but not heavily wet. Arrange seeds (leave a bit of place in between seeds so that there roots can grow freely, otherwise they could stick together and it would be hard to detach single root) on one moist towel. Cover the 1st one with the 2nd moist towel and press them lightly together. This will make sure that seeds will come in contact with wet surface. Also in this way there will be no big air pocket inside. The important part is to keep the moist towel in an air tight plastic box/zip lock plastic bag. I personally use air tight plastic container. This system will retain the moisture. Keep the box/bag in a dark place or in a place which gets normal light. But don't keep under sunlight. Check every 2 to 3 days the condition. I found that sometime the towel need to be bit moister, so I sprayed water a bit. Once germinated, carefully take the seedling and plant in a desired container. You see the picture at the beginning of this post which shows my tomato and cucumber seeds germinated using this method. be germinated. Most of the seeds need 20 degree (or above) temperature to germinate successfully. I have been following this method since last year December and most of my seeds have been germinated in 3-4 days, while my seeds in container took much longer time to sprout. If you have not tried this, give it a shot. And if you have already experienced this method, please share your experience/comment.